It has been suggested that this article or section be merged into Hades Cup. Unlocked Level up all Drive Forms and Summons to level 7 and complete the second visit to Space Paranoids. 35 Rapid Thruster x ? 45 Armored Knight x ? The Hades Paradox Cup (裏ハデスカップ, Ura Hadesu Kappu?) 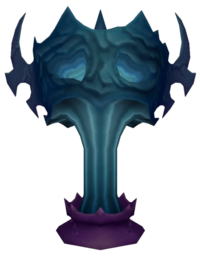 is one of the four cups that can be entered by talking to Hades in his chamber in Kingdom Hearts II, and is the longest and hardest in the game. The tournament consists of fifty matches with the cup's rules changing every ten matches. A boss is fought on every tenth match and the final boss is Hades in Berserk mode. Upon winning the cup, the Hades Cup Trophy (ハデスカップトロフィー, Hadesu Kappu Torofī?) is received. No restrictions. Sora has access to Drives, Summons, and his allies. Titan Cup rules. Sora fights alone, and cannot use Drives, but Summons are available. There is also the Damage Points restriction with Sora starting out at 500 points. Pain and Panic Cup rules. The Drive Gauge is locked, but Summons and Allies are available and Limits consume less MP than usual. Cerberus Cup rules. Forms are available, and Drive Gauges fill much faster than normal. There is also a ten-minute timer. No Summons, no Drives (with the exception of Limit Form in Kingdom Hearts II Final Mix), and no allies; only the Keyblade, magic, and Trinity Limit are available. This page was last edited on 8 April 2019, at 11:39.